The Nyffeler Collection of German Porcelain; Christie's, London, 9 June 1986, lot 42. Zürich, Switzerland, Kunsthaus, Schonheit des 18 Jahrhunderts, 1955, no. P.24. Kändler's 1740-1748 work records note 1 Grouppgen, ein Frauenzimmer in einer Andrijan wohlgepuzt vorstellend, ingl. einen Schäffer in seinem Habit wohl angekleidet, welche einander embrassiren, worbey moch ein Schäffgen zu befinden, 12 Thlr. 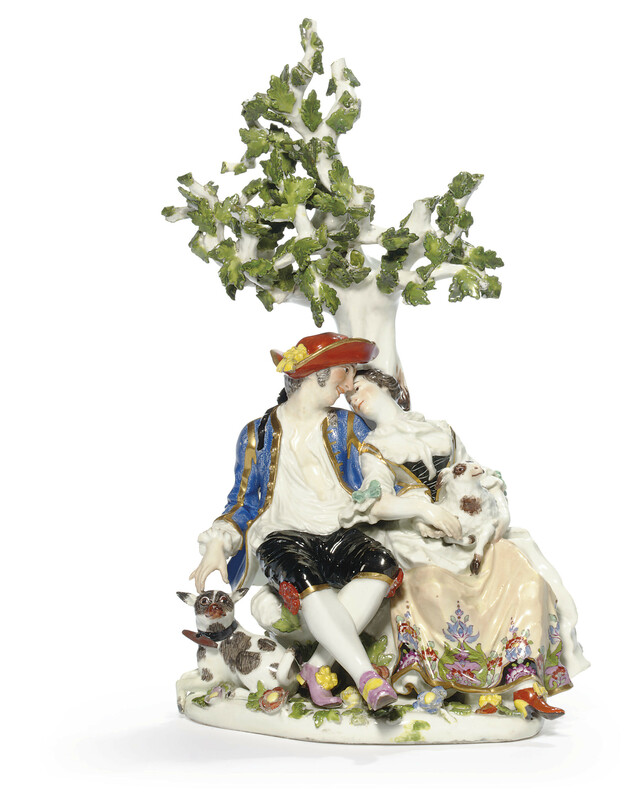 The present model, based on a painting by François Boucher, was produced both with and without the tree behind the amorous couple. See P.W. Meister, Catalogue of the Pauls Collection, London, 1972, vol. I, pp. 238-239 and Rainer Rückert, Meissener Porzellan, Munich, 1966, p. 168, Tafel 869. For similar examples without a bocage, see the group sold Christie's, London, 13 December 2001, lot 643; the example in the Pauls-Eisenbeiss Collection (Kirschgarten, Basel), illustrated by Ingelore Menzhausen and Jürgen Karpinski, In Porzellan verzaubert, Basel, 1993, p. 149; the example illustrated by Rainer Rückert in Meissener Porzellan Munich, 1966, pl. 209, no. 869; and the example in the Victoria and Albert Museum, the Gift of Mrs. Oswald Finey, number C.24-1984. For groups with the tree trunk similar to the present example, see Christie's, London, 10 July 1973, lot 124 and Christie's, London, 8 July 2002, lot 288.